Washington Grain Commission – Episode 93: Dennis Solbrack May Not Bleed Green, But He Lives Green, John Deere Green! Episode 93: Dennis Solbrack May Not Bleed Green, But He Lives Green, John Deere Green! 10.2.18 After their families, there may be nothing more important to farmers than their equipment. Regardless of the color of that equipment—John Deere green or Case IH red, farmers are sure to enjoy episode 93 of Wheat All About It entitled: Dennis Solbrack Doesn’t Bleed Green, But He Lives Green—John Deere Green! Solbrack, who has a 36 year history at the Deere location outside Colfax, talks about the evolution of machinery from hoof to “horse power”, through the introduction of hydraulics and creature comforts to today’s world of microprocessors. Solbrack also addresses the productivity of today’s combines—which come with lots of advantages—but some drawbacks too. 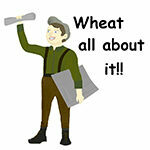 You can subscribe to Wheat All About It! on iTunes and other podcast apps including Stitcher, Overcast and Pocket Cast and never miss an episode!